As everyone knows, Thanksgiving is one of the most high-pressure meals of the year for the home cook. Not only are there several side dishes to prepare (as well as trying to figure out how they'll all fit in the oven and be hot at mealtime), but there is, of course, the centerpiece of the holiday meal—the big old bird. First, one of the best ways to alleviate some of the stress is to plan ahead and get organized. Make a list of what you want to cook and how long each component will take, and then structure your day (or days, because cooking ahead is the best way to tackle meals like this) around the menu. Since the star of the show is the turkey, you should base your Thanksgiving day timeline around when it will be done. There are handy charts to help you calculate minutes-per-pounds, but there are some other factors that you will need to take into consideration as well. Before you can even think about putting the turkey in the oven, you need to do a little prep ahead of time, no matter if your bird is fresh or frozen. If fresh, it is ideal to remove the wrapping the night before, take out the giblets from inside the cavity, rinse and pat dry (if your turkey hasn't been brined), and let sit, uncovered, in the roasting pan in the refrigerator. This way the skin dries out, allowing it to crisp up nicely in the oven. If your bird is frozen, then you need to start thinking about it a few days ahead of Thanksgiving—you will need one day for every four pounds of meat. A 12-pound turkey will take three days to defrost in the refrigerator, while a 20-pound takes five days to thaw. See our handy guide to Thawing a Frozen Turkey for more information. Once it is defrosted, follow the same instructions for a fresh turkey to assure crispy skin. The general rule for cooking a large bird is about 20 minutes a pound. But these cooking times vary, depending on whether you begin with a turkey that is stuffed versus one that is not. A stuffed turkey will take up to 30 minutes more than one that is unstuffed. In addition to checking the temperature of the turkey, you need to check the temperature of the dressing as well. The center of the stuffing inside the bird (or in a separate baking dish) must reach a temperature of 165 F for food safety. For an unstuffed turkey, place the meat thermometer in the thickest part of the thigh, taking care that it does not touch any bone. 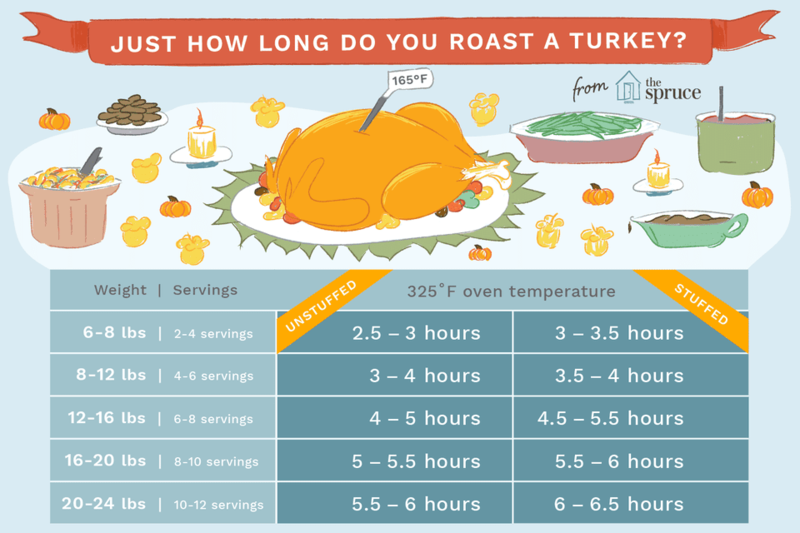 Roast the turkey until the meat thermometer reaches 165 F.
If you are using a conventional oven recipe, the chart above will help you determine approximately how long to roast a stuffed and unstuffed turkey. If you have a convection oven, know that this will move things along faster. The roasting times in the chart are for a preheated 325 F oven. Oven cooking times vary, though, so always use a meat thermometer to gauge doneness; this does not include the pop-up timer that comes in the turkey. You can use an instant-read thermometer, which you place in the turkey (in the thickest part of the thigh) every once in a while—and then remove—to check the cooking progress, or an ovenproof thermometer which is inserted in the bird before it goes into the oven and left there while the turkey is cooking. There are also probe thermometers which allow you to see the internal temperature on a monitor—no need to open the oven. (Some oven models actually include a probe feature.) No matter which type of thermometer you use, start checking the temperature a half hour to an hour before the turkey should be done and then every 15 minutes thereafter. You are looking for a temperature of 165 F.
In addition to the preparation tips for a crispy skin, there are a few other things you'll want to have ready to achieve the perfect roasted turkey. First, make sure you have the right size roasting pan—a heavy construction is best to hold the weight of the bird—as well as a roasting rack (unless you plan on sitting the turkey on a bed of vegetables). And an instant-read thermometer is crucial—do not rely on the pop-up timers! You should also have decided ahead of time how you are seasoning the turkey. Whether you are using an herb butter under and on top of the skin, stuffing the cavity with aromatics, or sprinkling a flavorful rub over the whole bird, you will need all of the ingredients prepared before the turkey is ready to go in the oven. Because of the variability of cooking times, it's always safer to cook stuffing outside of the bird, but if you are going to stuff it, check the temperature of the dressing before serving and don't be afraid to microwave it to make sure the temperature is right. A moist, low-temperature environment (like the inside of a turkey) is ideal for bacteria, and these are guests no one wants at their holiday dinner.